Many Jews were exiled in Babylon around 600 years before Jesus. Released after 60 years, they returned to a devastated Jerusalem and Mount Zion. 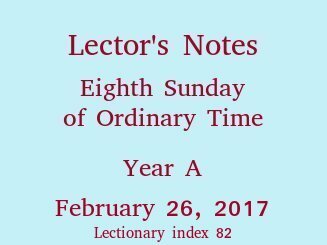 Some thought that God had forgotten them or was still punishing their sins. The church in Corinth was divided by loyalties to certain teachers and the wisdom they claimed. Some even claimed Saint Paul as their leader. But he wants them all to be joined in pursuit of a higher wisdom, an undvided community, and a single Lord. Jesus wants his followers to have a single Master. He recognizes the fears that might make his followers divide their loyalties, and tells them how to cope. The Historical Background: The people of Israel spent a couple of generations in exile, captives of the Babylonians, from about 600 B.C.E. to 540 B.C.E. The second major part of the book of Isaiah, chapters 40-55, concerns the end of this Exile and the return of the captives to their homeland. We're familiar with this part of Isaiah because it begins with memorable images of the return from exile. The church likes to proclaim them in Advent, Handel set them to music in his Messiah, and contemporary composers cite these verses, too. "Comfort ye my people, saith your God." "A voice cries in the wilderness, 'Prepare a way for the Lord!'" "Like a shepherd he leads his flock, and gathers his lambs in his arms." By this time the southern kingdom of the Promised Land was known as Judea, its capital was Jerusalem, and Zion was the hill within Jerusalem where the temple had stood. "Zion" and "Jerusalem" can stand for the people who lived and worshiped there, for the exiles returning there, or for those who were not dragged off into exile but awaited the return of their compatriots. The Exile had been indescribably hard for these people, and it shook their faith most deeply. Their theology led them to believe the exile was divine punishment for their unfaithfulness, and they had a hard time even imagining what it would be like to be in God's favor again. So "Zion was saying, 'The Lord has abandoned and forgotten me.'" To this dismal outlook, Deutero-Isaiah replies with tender and hopeful images, meant to strengthen their faith. Proclaiming It: You have to make the first sentence, the quoting of the hopeless inner thoughts of the guilty, stand on its own. Say that sentence and pause. In the next sentence, you are not the same person. You're God (or the prophet speaking for God) giving reassurance and love. Imagine how you would sound offering unconditional love and forgiveness to a shame-filled loved one who has disappointed you grievously. You would be tender but emphatic. That's what this reading deserves. The Historical Background: Ancient Corinth was an exciting, uncontrolled place, and the Christian community there no less so. It didn't surprise Paul that his authority as an apostle was questioned there. Already in the letter we've seen that some Christians gave their loyalty to a Christian teacher named Apollos, and others to a Cephas, still others to Paul. Others distanced themselves from those factions by professing loyalty to Christ, instead. Paul has already called these fractious folks infants (3:1-2). The partisan groups may have tried to justify themselves with claims to wisdom. But Paul wants to cut through the assertions of wisdom and the divisions. He appeals to a higher, spiritual wisdom. His ultimate concern is that the people be unified in love. He sets a humble example by saying he (like Apollos and Cephas) should be regarded as a servant, a steward protecting something that belongs to God, for the good of everyone. He doesn't judge anyone, and wants no one to judge him except the God whom he serves. Proclaiming It: Make sure you understand how every sentence in the reading is explained by the description above. Pause between sentences, so your listeners have a chance to think about each. You're speaking in the name of Paul, who had an unshakable faith in his calling to be an apostle and a deep love for the people to whom he was writing. Sound like he would sound. In keeping with today's gospel, it seems right to display a picture of flowers not cultivated. 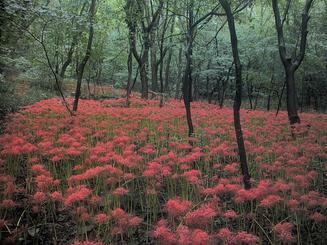 These are Lycoris radiata or red spider lilies. The image is from here, a site offering hundreds of free images suitable for computer screen wallpaper.